OK…don’t these apples look delicious! You can get a free sample by filling out this form. 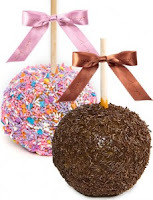 These are Ivan Mog’s Gourmet Apples — who uses homemade kettle caramel, all-natural ingredients and no preservatives, on jumbo firm and slightly tart granny smith apples, with a host of delicious toppings and flavors! OK, my mouth is watering – how ’bout yours?